As if out of nowhere, hundreds of thousands of protestors took to the streets, fueled by poverty, hunger, and anger at their repressive autocratic government. Though the regime was hailed as a beacon of stability in an otherwise volatile region, its collapse was as unexpected as it was rapid. The police quickly lost control, the military refused to fire on protestors, and within the scope of a few days the old order came crashing down. The West, while outwardly supportive of the people’s democratic aspirations, worried about the loss of a stable Middle East ally which had developed historic military and intelligence coordination with Israel. The description above could serve as an account of events leading up to the overthrow of Egyptian strongman Hosni Mubarak. However, it also tells the story of the great Iranian uprising. Not the 1979 revolution that ushered in Ayatollah Khomeini and his cohorts—the feared replay of which has caused much handwringing among some neoconservatives and their Likud counterparts—but rather its 1951 precursor, which ended in 1953 with a U.S.- and UK-backed coup to restore “stability” to the region. In many ways, the West’s uncompromising prioritization of its strategic interests over its stated guiding principles was directly responsible for the later outgrowth of a virulently anti-American political philosophy in Iran. Though Egypt’s revolution may not resemble Iran’s in 1979, the way the U.S. responds to the ousting of an unpopular—but western-friendly—dictator could go a long way towards creating the conditions for a similar outcome. Though largely forgotten in the West, the CIA-orchestrated coup that ousted democratically elected Iranian Prime Minister Mohammed Mossadeq is ingrained in the collective consciousness of the Middle East. Back in the early 1950s, the Iranian public had grown weary of their stagnant economy, rising unemployment, and most of all, the painfully imbalanced oil concessions that siphoned much-needed public money into foreign hands. Previous attempts to address the issue, even entreaties by the Shah himself, were rebuked by the British. Frustrated by their powerlessness, Iranians rallied behind an emerging leader who promised to address the issue by nationalizing the country’s oil resources. His successful election and appointment as prime minister worried Iran’s western allies, who feared that his nationalist populism would not conform to their strategic regional objectives. Almost immediately, the U.S. establishment went into propaganda overdrive. Analysts and press outlets warned of Soviet ties to the new “radical” government under Mossadeq, whom they accused of harboring secret “communist leanings.” Galvanizing U.S. fear of Soviet encirclement, politicians and diplomats warned that the new government, though democratically elected, would almost certainly evolve into a Soviet satellite. This fear-mongering campaign culminating with John Foster Dulles’s warning President Eisenhower that “a communist takeover is becoming more and more of a possibility.” Spurred by a perceived need to counter radicalism and secure regional stability, Eisenhower gave the go-ahead for Operation Ajax which—through a combination of bribes, blackmail, and staged protests—set the stage for a coup to oust Iran’s democratically elected president and return the Shah to power. In retrospect, Mossadeq now appears to have been little more than a “progressive liberal.” But fogged by the fear and paranoia of the time, the U.S. government chose to handle him as an existential threat to U.S. regional influence. The United States has been paying for this mistake ever since, as scholars on Iran almost unanimously agree that the interference and subsequent dismantling of Iran’s democratically elected government played a significant role in the widespread anti-Americanism that later characterized the 1979 revolution. Unless the Obama administration is very careful, the United States may very well make the same mistakes again in Egypt. And like 1953, there may be no second chances for decades to come. Though the Obama administration’s outward handling of the Egyptian uprising bears little resemblance to the subversion of Operation Ajax, Egyptians by and large have viewed the U.S. position with skepticism. And for good reason. Initially lukewarm to the very idea of protests, Obama and his team begrudgingly evolved from uttering statements supporting “our friend” Mubarak, to calls for “reform,” to vague requests for an eventual transition. In a pattern similar to his response to Tunisia, Obama explicitly refrained from celebrating the people’s uprising until they had already won. For many observers both in and outside Egypt, U.S. policymakers appeared to be hedging their bets, staying on good terms with Mubarak in case he weathered the storm while refraining from the type of overt statements of regime support emanating from Riyadh and Tel Aviv. Reports from practically all news sources—including the New York Times, the Washington Post, and the BBC—highlighted Washington’s schizophrenic posturing. In reality, contrary to being the monolithic menacing organization depicted in western media, the brotherhood is actually a loose coalition of groups with widely divergent political and religious goals. The Muslim Brotherhood renounced violence in 1928 and explicitly endorsed democracy as its ideal political system. It is probably better known in the Arab world for its compromises with Arab dictators than its attempts to undermine them. There are few objective indications that the Muslim Brotherhood is predisposed to violent fundamentalism. In addition, the brotherhood has received lavish financing and support in past years from the United States and the United Kingdom, and it continues to enjoy U.S. support as part of the March 14 Alliance in Lebanon. And yet, elements of western discourse remain saturated with depictions of the Muslim Brotherhood as violent, disingenuous, secretive, and sinister. The future role of the Muslim Brotherhood in Egyptian politics belongs to the Egyptian people and no one else. Forcing them to decide otherwise, particularly at this early stage in the nation’s transformation, would compromise their freedom of choice as well as the democratic values that the United States ostensibly advocates. 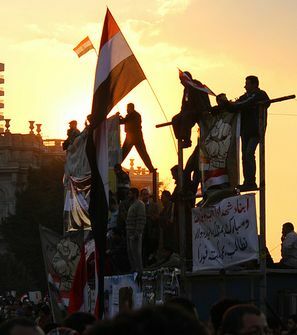 Evidence suggests that the political leanings of the Egyptian demonstrators were solidly secular. Any objective on-the-ground analysis in Egypt would doubtless confirm that the Muslim Brotherhood did not control the pace or direction of events. Their initial refusal to take part in the demonstrations, their minimal impact once they did participate, and the largely secular nature of the protestors all point to a very different political trajectory in Egypt’s future. As’ad Abou-Khalil, a professor and well-respected political blogger, breaks down the demographics into the following categories: “15 percent Muslim Brotherhood, 5 percent various Arab nationalist and progressive parties, and 80 percent who belong to no parties at all.” Hardly a resounding endorsement of the brotherhood. Why then all the handwringing? Perhaps, as some have speculated, the specter of the brotherhood is merely a way to arouse fear and suspicion in order to maintain—as in the case of Mossadeq in 1953—sufficient influence and control to ensure the fulfillment of western strategic interests. As the events in Iran demonstrated, such short-term thinking is almost certain to backfire in the long run. Had U.S. policymakers earnestly respected the aspirations behind the uprising, they would have been more vocal in their support for the demonstrators, rather than uttering weak endorsements for “stability “and “adherence to international commitments” (aka the Camp David Accords). Ironically, the fear of the brotherhood has led U.S. policymakers to state that the best way to safeguard the democratic aspirations of the Egyptian people is to delay elections and consolidate state control within the military. Considering that such a position involves shuffling players but leaving the status quo intact, it is unlikely to find much traction with the Egyptian public. Perhaps the greatest irony of the U.S. response to the Egyptian uprising can be found in Obama’s recent acknowledgement of the U.S. government’s errors in 1950s Iran. In his Cairo speech, for the first time a president explicitly acknowledged that “the United States played a role in the overthrow of a democratically elected Iranian government” and pledged a new beginning in relations with the Muslim world. The American Enterprise Institute followed up by admitting that Mossadeq was little more than a “secular nationalist,” and WINEP conceded they may have been “on the wrong side of history.” With the conflated threat of nationalist populism fading from the U.S. collective establishment’s imagination, so too was the once solid justification for interference in Iran’s political structure. Presented with a déjà-vu, the United States still can’t seem to get it right. Indeed, although many in the Obama administration were sympathetic to the Egyptian cries for liberation, their cautious approach produced a backwards response. They remained tepid as nonviolent protestors were beaten and killed. They appeared complacent about the ascension of decidedly anti-democratic figures such as Umar Suleiman and Hussein Tantawi. Despite arguments from figures like Elliott Abramsthat the revolution is narrowly focused on domestic policy, it would be naïve to assume that Egyptians are not watching U.S. reactions very closely. The sheer volume of protestors calling Mubarak an agent of the Americans and of Israel reaffirms that U.S. actions in Egypt will have consequences for decades to come. If conservative pundits are so worried about a reply of Iran 1979 and liberal Democrats are keen to avoid another Mossadeg-like disaster, then both factions need to stop promoting the same failed policies that produced those results. Stephen Kinzer, All the Shah’s Men, Hoboken: John Wiley & Sons Inc, (2003), p. 6. Stephen Kinzer, All the Shah’s Men, Hoboken: John Wiley & Sons Inc, (2003), p. 85. Donald N. Wilber, Clandestine Service History: Overthrow of Premier Mossadeq of Iran, March 1954, http://www.webcitation.org/5hOKk6ByB. Kareem Fahim, Mark Landler, Anthony Shadid, “West Backs Gradual Egyptian Transition,” New York Times, February 5, 2011, http://www.nytimes.com/2011/02/06/world/middleeast/06egypt.html. Helene Cooper, Mark Landler, David E. Sanger, “In U.S. Signals to Egypt, Obama Straddled a Rift,” New York Times, February 12, 2011, http://www.nytimes.com/2011/02/13/world/middleeast/13diplomacy.html. Marc A. Thiessen, “How Obama Lost the Egyptian People,” Washington Post, February 15, 2011. http://www.washingtonpost.com/wp-dyn/content/article/2011/02/14/AR2011021403059.html. 7 Jonathan Marcus, “Does the US really want Mubarak to go?” BBC World News, February 5, 2011, http://www.bbc.co.uk/news/world-middle-east-12374181. Peter Nicholas and Christi Parsons, “Obama’s advisors split on when and how Mubarak should go,” Los Angeles Times, February 10, 2011, http://www.latimes.com/news/nationworld/world/la-fg-obama-team-20110210,0,5447678,full.story. Ali Alfoneh, “The Egyptian Military’s Coming Collapse,” American Enterprise Institute, February 4, 2011, http://www.aei.org/article/103122. Robert Satloff, “Recent Developments in Egypt and Lebanon: Implications for U.S. Policy and Allies in the Broader Middle East,” Testimony prepared for delivery to the U.S. House of Representatives Committee on Foreign Affairs, February 9, 2011, http://www.washingtoninstitute.org/html/pdf/SatloffTestimony20110209.pdf. Lila Gilbert, “An Uncertain Future for Egypt’s Christians,” Weekly Standard Online, February 7, 2011, http://www.hudson.org/index.cfm?fuseaction=publication_details&id=7696&pubType=HI_Opeds. James Phillips, “Egypt’s Muslim Brotherhood Lurks as a Long-Term Threat to Freedom,” Heritage Foundation, February 8, 2011, http://www.heritage.org/Research/Reports/2011/02/Egypts-Muslim-Brotherhood-Lurks-as-a-Long-Term-Threat-to-Freedom. Scott Whitlock, “Chris Matthews Rips Obama’s Handling of Egypt Crisis: ‘I Feel Ashamed as an American,” NewsBusters, February 4, 2011, http://newsbreakingonline.com/news/chris-matthews-rips-obamas-handling-of-egypt-crisis-i-feel-ashamed-as-an-american.html. Clifford D. May, “Pyramid Scheme,” Foundation for the Defense of Democracies, February 10, 2011, http://www.defenddemocracy.org/index.php?option=com_content&task=view&id=11792080&Itemid=105. Essam El-Errian, “What the Muslim Brothers Want,” New York Times, February 9, 2011, http://www.nytimes.com/2011/02/10/opinion/10erian.html. Ian Johnson, “Washington’s Secret History with the Muslim Brotherhood,” New York Review of Books, February 5, 2011, http://www.nybooks.com/blogs/nyrblog/2011/feb/05/washingtons-secret-history-muslim-brotherhood/. Mark Curtis, “Colluding with Extremists,” New Left Project, March 8, 2010, http://www.newleftproject.org/index.php/site/article_comments/colluding_with_extremists/. As’ad Abou-Khalil, “Breakdown of Protestors,” Angry Arab News Service, February 7, 2011, http://angryarab.blogspot.com/2011/02/breakdown-of-protesters.html. As’ad Abou-Khalil, “Operation Ajax in Egypt,” Angry Arab News Service, February 7, 2011, http://angryarab.blogspot.com/2011/02/operation-ajax-in-egypt.html. Mehdi Khalaji and J. Scott Carpenter, “America and the Iranian Political Reform Movement: First, Do No Harm,” Washington Institute for Near East Policy, February 3, 2011, http://www.washingtoninstitute.org/templateC07.php?CID=512. Wa’el Chonim, “Ghonim,” Twitter, http://twitter.com/Ghonim. Elliott Abrams, “Egypt Protests Show George W. Bush Was Right About Freedom in the Arab World,” Council on Foreign Relations, January 29, 2011, http://www.cfr.org/egypt/egypt-protests-show-george-w-bush-right-freedom-arab-world/p23935.